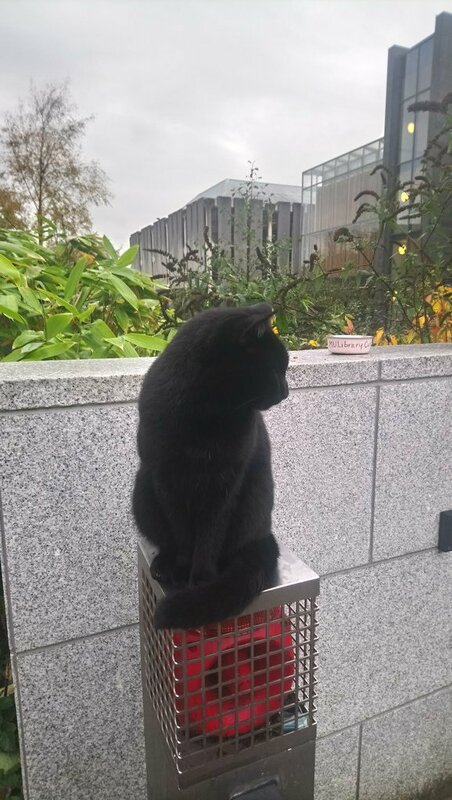 This entry was posted on November 5, 2018 at 3:29 pm and is filed under Maynooth with tags cats, Maynooth Library Cat. You can follow any responses to this entry through the RSS 2.0 feed. You can leave a response, or trackback from your own site. What on earth is he sitting on? A mystery object! Can’t you guess? The post is actually the control for double gates that can be closed to seal off the south campus. The red thing behind the grille is a warning alarm for when the machinery operating the gates is in operation. Yes, the red thing looked like a siren to me but the context required more prior information. Isn’t it obvious that the machinery is in operation from the fact that the gates are moving? To be honest I’ve never seen them move at all – they’re always open! Perhaps the alarm is only for use in emergencies, e.g. if someone or something gets stuck? Perhaps the siren is backup warning for car drivers who aren’t paying attention and whose vehicles might get hit by the gates (if the gates rotate on hinges rather than sliding in their own plane). Or for the visually impaired. It’s mainly a pedestrian area, just a few vehicles use the path for deliveries. The double gates rotate and meet in the middle of what is a rather wide mainly pedestrian thoroughfare. There are quite often people milling about so the alarm might just be to let them know what’s going on. Come to think of it, it’s probably not possible to see the barriers from the security lodge so that might be the reason. My cat avoids looking when I take a photo, I think the camera emits a IR beam as range finder! However, she also associates any balck thing I hold with a laser pointer and looks at her feet to see the laser spot to chase. Of course, I’m a laser safety officer!